It has been assumed that all muscles and their tendons act independently of each other and do not transmit force directly to adjacent muscle-tendon units. In other words, it is assumed each muscle-tendon unit acts as an independent force generator.This assumption is made in almost all biomechanical models of human musculoskeletal systems. However, the validity of this assumption is the subject of considerable debate amongst physiologists and biomechanics experts. A recent study of mine aimed to confirm whether there is force transmission between the gastrocnemius muscle and soleus muscle under passive physiological conditions in vivo and, if so, to estimate the magnitude of this force. To do this, we took simultaneous ultrasound images of the gastrocnemius and soleus muscles during passive knee flexion, while keeping the ankle angle fixed in one of two positions (the dorsiflexed or plantarflexed position). We measured the length of the individual muscle fascicles (groups of muscle fibres) during knee motion in both muscles. 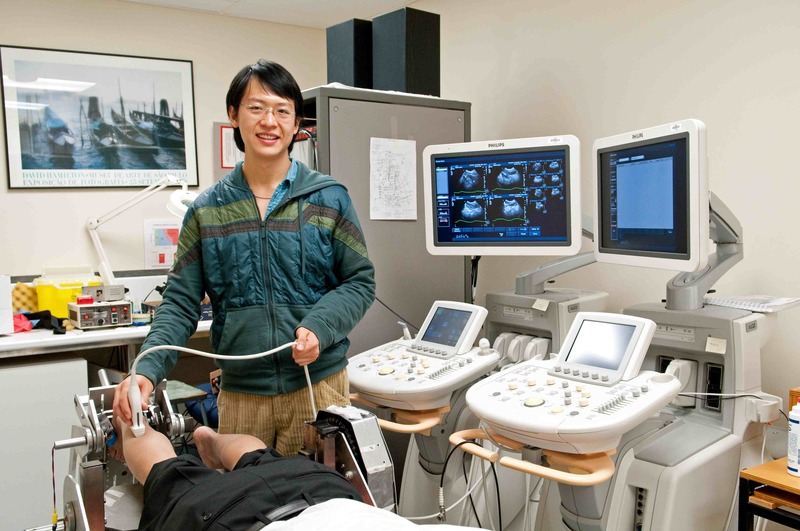 Ultrasound can be used to measure changes in muscle fascicle length. This research will improve our understanding of muscle mechanics and how certain disorders cause muscle disease. The data showed that the soleus muscle fascicles elongate significantly during knee motion when the ankle is not moving. Since the soleus muscle doesn’t cross the knee, if the two muscles are independent, we wouldn’t expect the soleus to change its length with knee motion, so this result suggests there may be some intermuscular force transmission between the two muscles. So, how big is this force, and does this mean all our existing biomechanical muscle models are wrong? I also did a quantitative analysis, to calculate how big the force would be in the soleus muscle based on how much it was stretching, which tells us how much current models would be out by. This analysis showed that the forces in soleus from this effect are pretty small compared to the force in gastrocnemius. Maoyi Tian completed his PhD in muscle mechanics and disease with the Gandevia Group. Maoyi is now a project manager with the George Institute in Beijing.